Why should I choose the Gordon Diagnostic System? About The Gordon Diagnostic System: This device aids in the diagnosis of attention deficits, especially Attention Deficit Hyperactivity Disorder (ADHD). It provides reliable, objective information about an individual’s ability to sustain attention and exert self-control. This practical, reliable, and well-researched device enhances the accuracy and relevance of a comprehensive evaluation for attention deficits and impulsiveness. The GDS is a microprocessor-based, portable unit which administers a series of game-like tasks. The Vigilance Task yields data regarding an individual's ability to focus and maintain attention over time and in the absence of feedback. A series of digits flash, one at a time, on a electronic display. 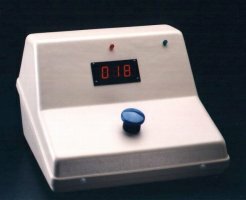 The subject is told to press a button every time a "1" is followed by a "9". The GDS records the number of correct responses, incorrect responses, and failures to respond to the "1/9" combination. A more complicated version of this paradigm designed for older children and adults (the Distractibility Test) flashes irrelevant digits on either side of the column that displays the target stimuli. For the testing of younger children the GDS contains a "1" mode which requires the child to press the button only upon appearance of a "1". The GDS also offers parallel forms of each task and a test of impulse control (the Delay Task) which requires a child to inhibit responding in order to earn points. Each task can be administered in less than 9 minutes. The internal microprocessor generates the tasks and records quantitative features of the child’s performance. These data can either be read off the GDS itself or transmitted to an external printer or computer. The GDS has been cleared as a medical device by the Food & Drug Administration, and boasts extensive standardization. Your purchase includes Delay, Vigilance, Distracability Tasks, Instruction Manual Interpretive Guide, package of 50 Record Forms, and four issues of the ADHD/Hyperactivity Newsletter with a one year warranty. The GDS Interpretive Guide comes with clearly-written documentation that fully addresses administration and interpretation of the test. The guide presents percentile and threshold tables, sample reports, and answers to common questions about interpretation. Norms for Auditory Module are available for ages 6-12 years (not for adults). The Gordon Diagnostic System (GDS) is available on a two month trial basis at a cost of $300 plus shipping. If, at the end of the two month trial, you would like to purchase the GDS, the $300 trial fee is deducted from the purchase price. The Trial Rental Program requires a simple contract which we will send you upon request, or you can download it here. Please fax the completed form to 315-446-2012. Note: Buy Now links on left represent prices for continental US orders only. International pricing and shipping charges will be calculated when you checkout.